As I discuss in this question, by far the most popular school of Hindu philosophy is the Vedanta school, which bases its tenets on the doctrines laid out in the Brahma Sutras, a work by the sage Vyasa which summarizes and systematizes the philosophical teachings of the Upanishads. (You can read the Brahma Sutras here.) Now as I discuss in this answer, apart from Advaitins most members of the Vedanta school believe in three Pramanas or means of valid knowledge: Pratyaksha or perception, Anumana or inference, and Shabda or scriptural testimony. 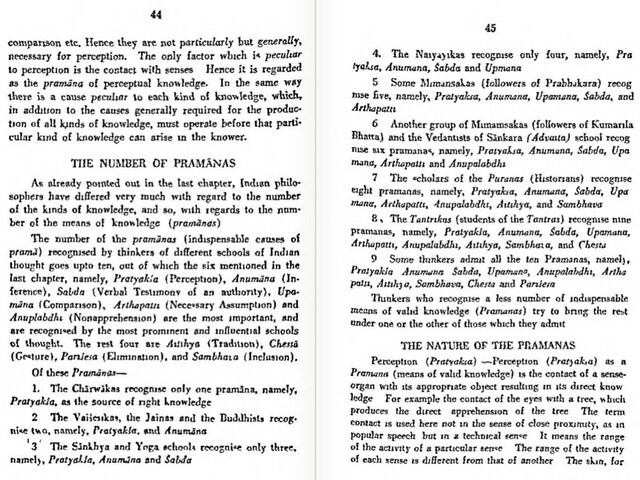 The number of pramanas (indispensable causes of prama) recognized by thinkers of different schools of Indian thought goes up to ten, ... namely, Pratyaksha (Perception), Anumana (Inference), Shabda (Verbal Testimony of an authority), Upamana (Comparison), Arthapatti (Necssary Assumption)[,] ... Anupalabdhi (Non-apprehension)[,] ... Aitihya (Tradition), Chesta (Gesture), Parishesha (Elimination), and Sambhava (Inclusion). The Charvakas recognize only one pramana, namely, Pratyaksha, as the source of right knowledge. The Vaisheshikas, Jainas and the Buddhists recognize two, namely, Pratyaksha, and Anumana. The Sankhya and Yoga schools recognize only three, namely, Pratyaksha, Anumana and Shabda. The Naiyayikas recognize only four, namely, Pratyaksha, Anumana, Shabda, and Upamana. Some Mimansakas (followers of Prabhakara) recognize five, namely, Pratyaksha, Anumana, Upamana, Shabda and Arthapatti. Another group of Mimansakas (followers of Kumarila Bhatta) and the Vedantists of Shankara (Advaita) school recognize six pramanas, namely, Pratyaksha, Anumana, Shabda, Upamana, Arthapatti and Anupalabdhi. The scholars of the Puranas (Historians) recognize eight pramanas, namely, Pratyaksha, Anumana, Shabda, Upamana, Arthapatti, Anupalabdhi, Aitihya, and Sambhava. The Tantrikas (students of the Tantras) recognize nine pramanas, namely, Pratyaksha, Anumana, Shabda, Upamana, Arthapatti, Anupalabdhi, Aitihya, Sambhava, and Chesta. Some thinkers admit all the ten Pramanas, namely, Pratyaksha, Anumana, Shabda, Upamana, Arthapatti, Anupalabdhi, Aitihya, Sambhava, Chesta and Parishesha. Thinkers who recognize a less number of indispensable means of valid knowledge (Pramanas) try to bring the rest under one or the other of those which they admit. I'm interested in the part in bold. My question is, what philosophical school believes in these ten independent Pramanas? Parishesha or Elimination is the process of knowing some thing by eliminating from a group of things those which it is not. For example it happens some time that we know a person to be somebody by eliminating others already known from the group where that person has been told to be present. To my mind Parishesha clearly seems reducible to Arthapatti at least. But what philosophical school believes that Parishesha cannot be reduced to any other Pramanas? Jiva Goswami of Gaudiya Vaishnavism accepts all 10 pramanas. By accepting only three of the ten pramanas Jiva Gosvami does not exclude the other seven. He says that pratyaksa, anumana, and sabda includes the other seven pramanas. The breakdown is as follows: upamana, arthapatti, sambhava, and cesta are included in anumana; abhava is in pratyaksa; arsya and aitihya in sabda. Not the answer you're looking for? Browse other questions tagged philosophy vedanta sects shad-darshana pramana .